There are three ways to build the programs in the leptonica-1.68\prog directory. The quickest way is to use the cl command from a Windows Command Prompt. However, if you plan to spend a lot of time investigating how a particular prog program works, it’s better to create a new Visual Studio Project for it. We’ll assume that you are going to build ioformats_reg.c. This is an excellent program to run if you want to be sure the main image libraries were built correctly (it doesn’t test giflib, see this section to test that). Leptonica will write temporary files to your temp directory. This is normally C:\Documents and Settings\<username>\Local Settings\Temp but can be changed by setting the TEMP and TMP environment variables. First, set up the proper environment variables for running the Visual Studio 2008 compiler from the command line by executing C:\Program Files\Microsoft Visual Studio 9.0\VC\bin\vcvars32.bat. You can use the Visual Studio 2008 debugger even for executables built from the command line. See How to: Debug an Executable Not Part of a Visual Studio Solution for more information. Once you’ve imported ioformats_reg.exe into the liblept solution by creating an EXE project for it, you can right-click ioformats_reg.exe and the choose Debug ‣ Start new instance or Debug ‣ Step Into new instance from the context menu. You can even set breakpoints in ioformats_reg.c before you do this. For anything other than just quickly trying out a leptonica-1.68\prog program, you should create a Visual Studio 2008 project for it. I tried to make the process simpler by creating a Project Template but Visual Studio 2008 doesn’t seem to support them for Visual C++. Instead you have two ways to build a prog program: manually create a Project for it, or use my Addin that automatically performs the steps of the manual method. The working directory is stored in a machine/user specific file so it can’t be distributed. You have to set this yourself. First right-click the prog_projects\ioformats_reg project and choose Properties from the context menu. Set Configuration: to be All Configurations. so that Visual Studio knows where to find liblept168d.dll when debugging applications that link with the DLL version of liblept. Exit and restart Visual Studio (or close and reopen the liblept solution). Move vs2008\CreateLeptonicaProgProjects.AddIn and vs2008\CreateLPP.dll to your Visual Studio 2008 Addins folder (normally C:\My Documents\Visual Studio 2008\Addins\). Select a file (or files) within the prog_files Solution Folder. 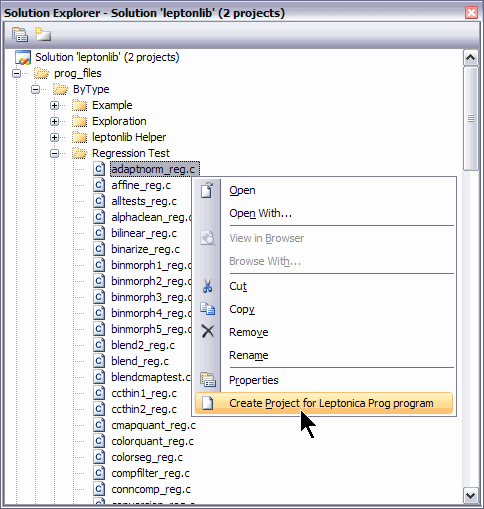 The popup context menu will only contain the Create Project for Leptonica Prog program choice for leptonica.sln and only for items within the prog_files Solution Folder. Right-click your new project, and choose Set as Startup Project. This makes your new project the default project for building and debugging. If the program needs command line arguments, right-click the project and set Properties | Configuration Properties | Debugging | Command Arguments. The easiest way to build all the prog\ programs is to open the prog_files\ByFilename folder. This contains all the prog programs, so just select them all and use the Addin to create Projects for them. When it’s done (it will take awhile), right-click the prog_projects Solution Folder and choose Build. When debugging console apps like the ones in the prog directory, put a breakpoint on the very last line in main() or on any exit() statements. That way you can view the program output in the Command Prompt window before it automatically disappears when the program exits. Alternatively, if you just want to see the program output and don’t need to debug, make sure the Project is the startup project, and choose Debug ‣ Start Without Debugging (Ctrl+F5). A “Press any key to continue...” message will appear when the program finishes. The Addin has only been tested on Windows XP Pro SP3. The c# sources for the Addin are in vs2008\CreateLeptonicaProgProjects.zip. The free Express editions of Visual Studio do not support Addins. You have to use the following manual method. If for some reason my Addin doesn’t work or you decide not to use it, you can always create projects for leptonica-1.68\prog programs manually by following the steps outlined here. Make a copy of the BuildFolder\leptonica-1.68\vs2008\prog_projects\ioformats_reg directory. Rename that directory to the name of the leptonica-1.68\prog program you are trying to run (in the following it will be shown as <progname>). The renamed copy of ioformats_reg must be in the same folder as the original since the project uses relative paths to find the prog directory. Delete the <progname>\LIB Debug, <progname>\LIB Release, <progname>\DLL Debug, and <progname>\DLL Release directories if they exist. Edit <progname>.vcproj and change all occurrences of ioformats_reg to <progname>. 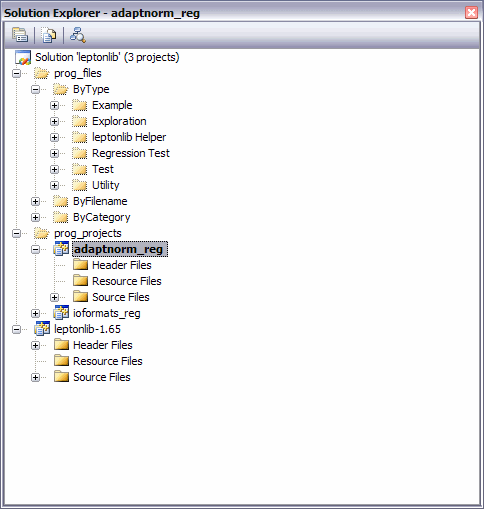 Right-click the prog_projects folder in Solution Explorer. Choose Add ‣ Existing Project... from the context menu. Select the <progname>.vcproj you just created. Do the last two steps of the automatic method if desired.